Oprah on Jay-Z: "I Love Him"
Looks as if your mom might be among those lining up to buy Jay-Z's crazily anticipated Blueprint 3 when it drops next month. Apparently, middle-class tastemaker Oprah Winfrey received a first-class Brooklyn tour from Hova himself on August 9 as part of a large piece for an upcoming issue of O! Magazine. 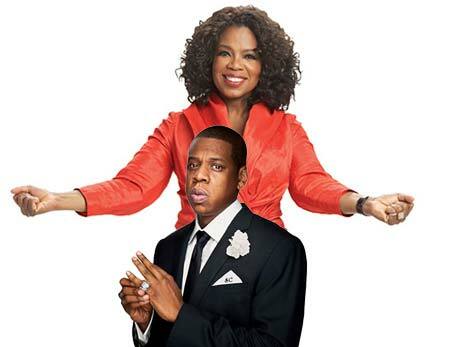 According to All Hip Hop, Jay-Z charmed Oprah so much that she was raving about him to her friend Gayle King. "I have some disagreements with the music. But I love him," Oprah said. "He was so charming and delightful and he smelled so good. It's that kinda thing where you hug a guy and his scent is buried in him... Everyone says how smart he is. He's really gifted and talented. At the end of the day, I felt that I made a friend." While no date has been set for the Jay-Z issue of O!, which is expected to print the interview in full, there is also speculation that Jay might appear on Oprah's television show in person. Don't be surprised if Oprah competitor Tyra Banks steps in to back silver-medalist 50 Cent, who's Before I Self-Destruct is also dropping on September 11.